Molar incisor hypomineralization (MIH) is a term used to describe a specific clinical entity in which there are demarcated opacities in erupting first permanent molars, frequently in combination with similar opacities in permanent incisors. Recently, comparable lesions have been reported in second primary molars and are referred to as hypomineralized second primary molars (HSPM). This chapter describes the diagnosis, etiology, and prevalence of MIH and HSPM and discusses the clinical characteristics and implications of this subgroup of DDE. Given the specific distribution of the developmental defects associated with MIH (and HSPM), the timing of any causative environmental disruption can be hypothesized to be between the 18th week of pregnancy and around 3–5 years of age. However, the evidence surrounding specific factors remains weak, not least because of a lack of consensus regarding assessment protocols and limited understanding as to the exact pathogenesis. Etiology seems to be multifactorial, and the etiological factors can be found in the pre-, peri-, and postnatal period. The literature suggests the worldwide prevalence of MIH varies between 2.8 % and 44 %, whereas for HSPM, figures of between 4.9 and 9.0 % have been reported. The presence of HSPM and demarcated opacities in erupting permanent incisors represents risk indicators for subsequent MIH. As MIH is associated with hypersensitive teeth, posteruptive loss of enamel and rapid caries progression early diagnosis is clinically very important. Elfrink ME et al. 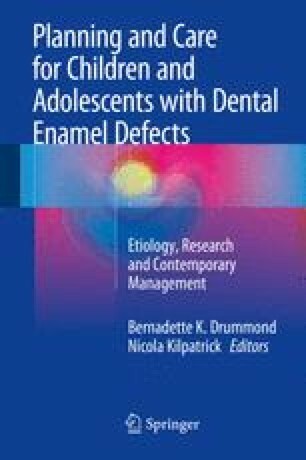 Pre- and postnatal determinants of deciduous molar hypomineralisation in 6-year-old children. The generation R study. PLoS One. 2014;9(7):e91057. doi: 10.1371/journal.pone.0091057 eCollection 2014.